On March 29, 2011 the editors Daily Pilot published a long commentary I submitted to them a few days earlier. 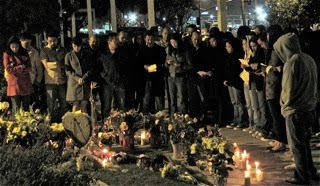 In that commentary I capsulized my views on the events in Costa Mesa over the previous fifteen months, and specifically the events that happened earlier that month. You can read it HERE. You can also read some contemporaneous blog entries I wrote about those events HERE, HERE and HERE. As we approach the holiday season, and with nearly two more years of turmoil and tumult behind us, I thought it was appropriate to refresh our memories about how things began with this current regime. In eleven months there will be an opportunity to return control of this city back to people who follow the rules, have the interests of the city paramount in their minds and treat residents with courtesy and respect. Now is the time to begin contemplating how important the election of November, 2014 will be to the future of this city. 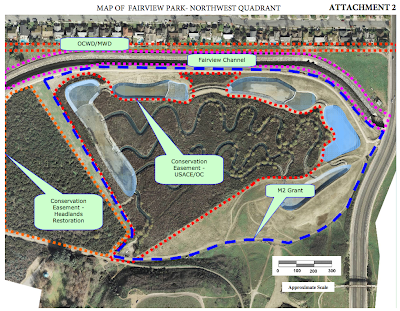 During one of the most frustrating meetings I've ever experienced, Wednesday night the Fairview Park Citizens Advisory Committee spun its way to a small victory. You can read the entire agenda report HERE. Unfortunately, rather than just take each of the eighteen (18) remaining items in order and discuss whether each should be given further consideration for possible inclusion in this quadrant of the park, the discussion got sidetracked for more than a half-hour when member Dennis Popp - the boring blogger who has become the de facto mouth for the current power elite - suggested they resolve Item #12 - Keep Master Plan as-is, first. What followed was a series of convoluted, confusing and, quite honestly, unnecessary Parliamentary maneuvers and circular conversations that resulted in the committee being right back where it started after 35 minutes of jousting. The staff will now take those choices, assess them as to where they might be considered in the Northwest Quadrant when taking into consideration many factors, including any specific prohibitions that are mandated by existing government agreements - mitigations, for example. 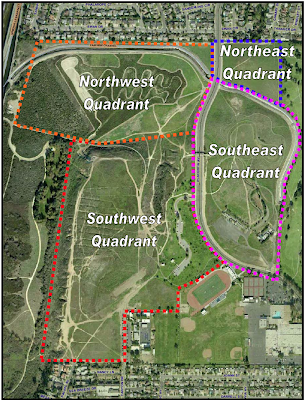 The committee will be presented with that analysis at their February meeting, vote again on them and send them to the Parks and Recreation Commission for consideration and subsequent forwarding to the City Council for consideration. 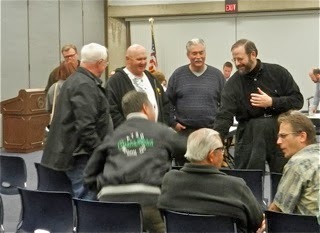 It was interesting to watch the dynamics at the meeting last night. 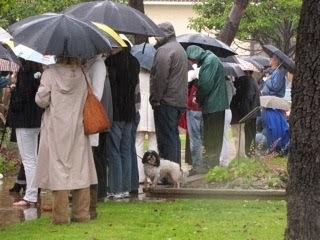 The other 27 members of the audience and I were noticeably frustrated by the early goings-on. There were lots of guffaws and grumbling as the committee painfully navigated their way to a decision. I was amused to watch Mayor Pro Tem Steve Mensinger - council liaison to this committee - busily texting or emailing during the discussions. Early in the discussions member Terry Cummings observed that there were clearly two factions on the committee - those who wished to keep the status quo and those who wanted playing fields everywhere. He suggested that, during this deliberation, efforts be made to find some common ground between the factions. 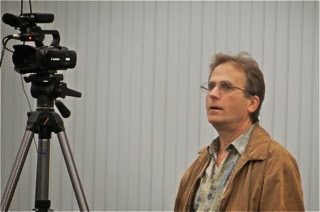 As has been the case recently, Barry Friedland - the official videographer of the power elite via his Costa Mesa Brief YouTube site - was on hand to record the proceedings. I expect you'll be able to view this two-hour meeting sometime in the next few days. Go HERE and look for it. Based on how this meeting went, and considering that this quadrant is probably the least controversial of the four that will be discussed, I suspect the meetings beginning in February will be a little more animated and contentious. Chairman Dr. Richard Mehren has his hands full managing this group and it won't get any easier in coming months. We'll see how it goes on February 5, 2014 - their next meeting date. 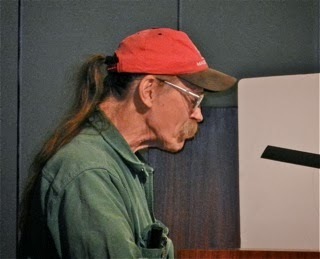 By the way, maybe the most interesting line of the night was uttered by Ron Amburgey during the brief discussion of the possibility of having an Archery venue in the Northwest Quadrant of the park. He said, "Where are the Indians when you need them?" Sensitive guy, huh? 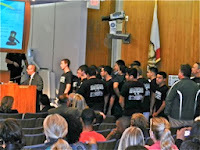 The Costa Mesa City Council meeting Tuesday began with some very positive notes - wonderful recognition during the Presentations segment - and ended early Wednesday morning with assaults on both the First Amendment of the United States Constitution and Civility. The meeting, which began promptly at 6:00, finally was adjourned at 1:18 a.m. this morning and, amazingly, there were still nearly two dozen people left in the chambers at that hour! Bear with me on this one - long meeting, long entry. Grab a cup of coffee or a Diet Coke and take your time... If you want to watch the streaming video of the event click HERE. 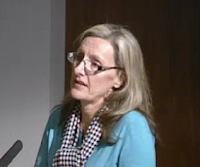 During the Jennifer Knapp presented a report on the status of the Estancia and TeWinkle Schools Foundation. Created with $1 million in seed money from the Segerstrom Family several years ago, this foundation provides financial support to the two schools involved. 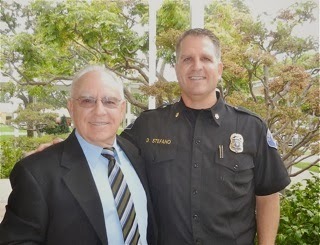 Next was the presentation was made by Costa Mesa Police Sergeant - and Army Reserve Lt. Colonel - Vic Bakkila to Costa Mesa Police Chief Tom Gazsi for his ongoing support of Army Reservists and National Guard members called to active duty. 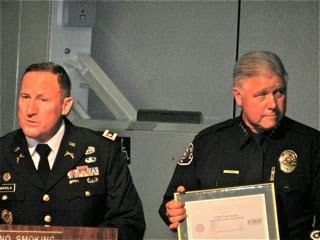 During his presentation of the "Patriot Employers Award" Bakkila stated that Chief Gazsi is without equal in his support for our employees serving our country in the Armed Forces. recognized for their victory over Estancia in the annual Battle of the Bell game, and for their league championship. Principal Phil D'Agostino thanked the council for the recognition. 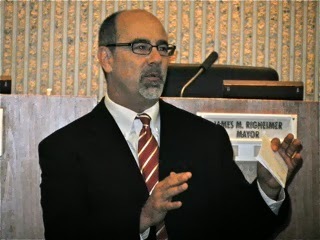 Next came the Public Comments segment at 6:35, when Righeimer and councilwoman Sandra Genis sparred over the proper procedure to be followed. Genis cited state and municipal code that REQUIRES the council to vote BEFORE changes are made to the agenda order. So, a vote was quickly taken and Genis and Wendy Leece came out on the short end of the 3-2 vote and the corruption of the public speaking process continued. Cynthia McDonald led off at 6:40 with a cautionary criticism for the council, encouraging them to be the models of civility instead of continuing the "us versus them" mentality that has been displayed recently. She directly criticized Righeimer for his distasteful analogy using Genis as a reference of being "smashed in the face" as an example of how decorum has declined recently. Her memory is apparently short because that kind of stuff has been going on ever since Righeimer was elected to the council. And, ironically, it only got worse last night. 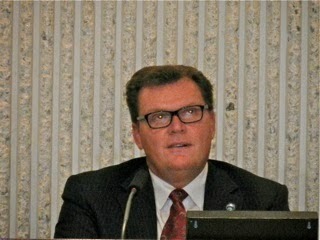 Only one speaker in the first session, Howard Hull, was supportive of the council majority. 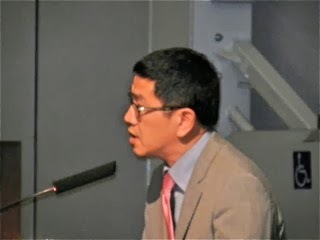 The remaining 90% of the speakers were critical of the majority as a whole or individually. Most addressed the corruption of the Public Comments, citing the Municipal Code and other authority. Terry Koken used his three minutes to entertain us with another ditty - the "OCGOP Blues". 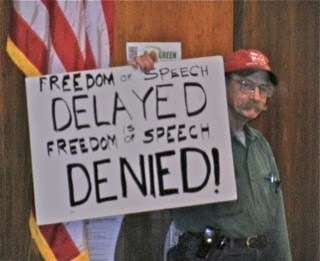 Then it was time for the second phase of free-speech quashing - the Consent Calendar. Only three of the fourteen items on the Consent Calendar were NOT pulled, those were voted upon and the "pulled" items - all eleven of them - were trailed to the end of the meeting, just before the remaining Public Comments. That meant the most contentious issue of the evening, Item #14 - the change in the order of the agenda - would be the final issue discussed last night. The discussion commenced at 11:52 p.m. There actually WAS some city business done last night, though. 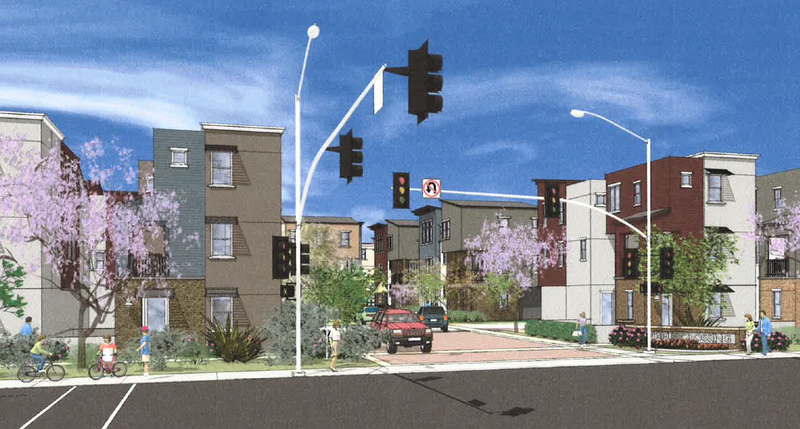 The council spent twenty minutes on Public Hearing #1, the change in the Residential Design Guidelines before passing it on a 4-1 vote - Leece voted no. Public Hearing #2, the extension of the moratorium on Hookah Lounges took less than five minutes and passed on a 5-0 vote. Old Business #1, the second reading of the re-definition of a "Single Housekeeping Unit" only took a few seconds to pass on a 5-0 vote. Old Business #2, HERE, the decision to completely delete the opportunity for "re-hearing" of items before the council (another move to quash dissent) took another 35 minutes and generated seven speakers unhappy with this scheme. 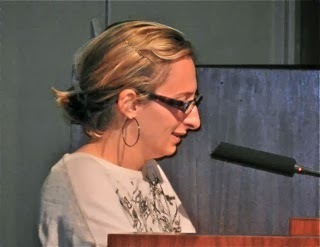 Normally mild-mannered educator Tamar Goldmann told the council this was "just plain stupid". Chris McEvoy - apparently emerging from a long hiatus - told the council that re-hearings were for our protection and it shouldn't be passed just for their convenience. One amusing, and telling, comment by Righeimer may give you a clue about how business is ACTUALLY conducted in our city. He attempted to cite that a council member who felt an issued needed to be addressed could try to convince one other member of the "winning side" to vote for a "re-consideration" of the issue. Well, that sounded very much like he was inviting a serial conversation outside a meeting - a clear and flagrant Brown Act violation. All the debate was futile - it passed on a 3-2 vote. And Righeimer called for a break at 8:40. 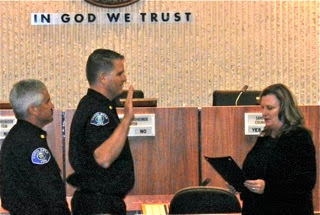 When they reconvened at 8:53 they took up New Business #1, the 37 Condominium units on Victoria Street at Maple Avenue. 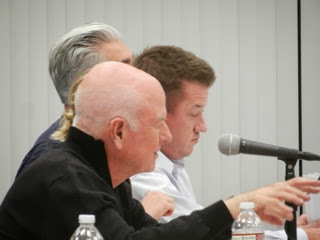 Former employee Don Lamm, who left Costa Mesa for a brief stint as City Manager at Westminster, was the developer's representative and began by slathering so much over-the-top flattery on the council that it actually tested my gag reflex. No vote was taken, but direction was given for this screening request and the project will continue. UPGRADE OF AUDIO/VISUAL INFRASTRUCTURE A "GO"
New Business #2, HERE, was the discussion of spending more than $1.6 million on much needed and very overdue technological enhancements to the City Council Chambers and the entire Audio/Visual support infrastructure. I think everything they asked for is necessary, although I didn't like the redesign of the chambers that removes seating for ten guest to make space for a "work table" for staff. 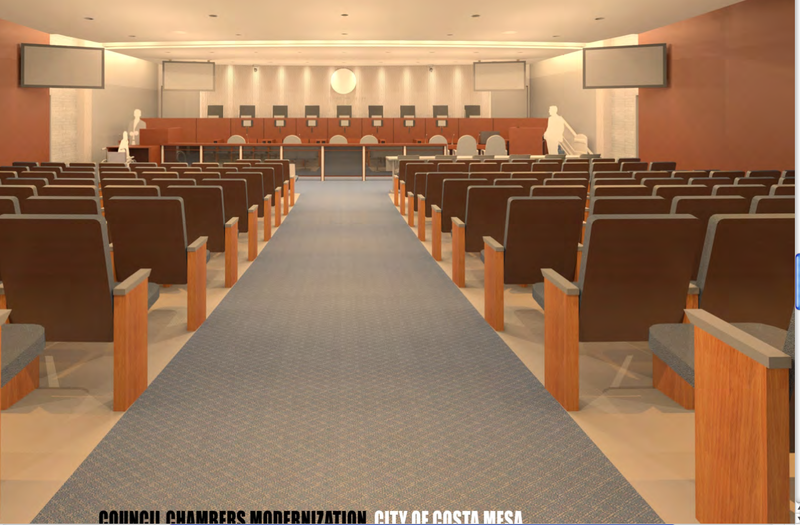 Five speakers rose in support of this project and the council finally approved moving forward with it at 10:10 p.m.
Next up was New Business #3, the controversial "Excessive Use Of Services" issue, HERE, which was led by Assistant CEO Rick Francis. During the lengthy discussion Genis pointed out that it seemed like a tool that could be used to put somebody out of business. Well, if you recall back several months ago, that's precisely what Righeimer was asking for. He told us all that he wanted to drive the perceived value of some of those properties down so the owners would be more reasonable when they were squeezed out by fines and penalties - and at one point he actually said it might be necessary for the city to buy some of those places at market rates and sell them for a loss to developers to get the property "improved". Well, he's got a tool now and that fact was not lost on representatives of the industry. Several speakers - either motel owners, operators or representatives of trade associations - stepped up to express general and specific concerns about this ordinance. The low point was when a gentleman named Wilson Wang - President of the Taiwan Hotel/Motel Association of Southern California - stepped up to express his concerns. He mentioned that once a guest checks into a room it is his domain and the motel operators have very little authority to do much about them. As he discussed the fact that his members who operate properties in the city are not feeling very welcome he mentioned the Transient Occupancy Tax, at which point Righeimer abruptly and rudely interrupted him and said, "You can keep your TOT and take care of your property!" Wang, and the rest of us in the audience, were stunned at the rudeness of the mayor. For a guy who has spent a lot of time in Las Vegas the past couple of years trying to lure businesses to Costa Mesa, he seems completely bereft of common courtesy. Later in the meeting he acknowledged that he gets rude late in meetings. Gee, no kidding! MORE RUDENESS BY THE "DICTATOR"
According to the mayor, this is a very serious issue in our city, which needs to be fixed by bold action. Well, this bold action has driven him to fits of rudeness not seen on the dais before. During the discussion Genis had the floor and was making a point when Righeimer interrupted her, to which she demanded, "Can I please finish?!" It's becoming very clear that Righeimer is unclear about his role up there on the dais. He apparently thinks being mayor equates to being dictator, because that's exactly how he acts. Finally, at 11:30, the council voted 5-0 to give the new ordinance a "first reading", and staff will return with some amended language for the second one after the first of the year. In my opinion, this issue continues to be plagued by questionable staff work. It may because Righeimer has so fully immersed himself in the minutia of the issue that the staff is being whipsawed by his capriciousness. Or, it just could be sloppy staff work. The end result is the same. During the next twenty minutes the council blitzed through the "pulled" Consent Calendar items. There were a few heated moments, though. 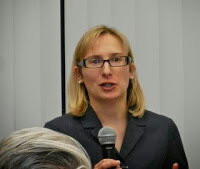 Anna Vrska stepped up to ask about Iem #9, the $200,000 request for engineering support services, HERE. As she asked a question Righeimer barked at her, "Why don't you read the staff report?!" Her response was that there were none available in the chambers, so Righeimer read her the riot act. When she paused for a moment, composed herself, then observed that she wasn't quite sure how to respond to such rudeness Righeimer replied, "I'm rude this time of night!" It was a surreal scene... He cut her off and moved on. Finally, at 11:52 p.m. 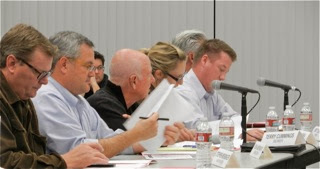 Item #14, the Modification to Public Comments and Consent Calendar issue, HERE, was opened up for discussion. Righeimer just turned it over to the Public who wished to speak and Terry Koken led the parade of fourteen (14) speakers who stuck around until midnight to address the council on this important issue. He brought with him a homemade sign that says it all. In addition to Koken, speakers included former councilman Jay Humphrey; former Planning Commissioner and member of the City Attorney's office, Eleanor Egan; angry resident Jay Photoglu; retired city planning official Perry Valantine; activist Charlie Mooney; educator Tamar Goldmann; long-time resident and activist Beth Refakes; resident Greg Thunnel; activist and President of Costa Mesans 4 Responsible Government Robin Leffler; member of the Fairview Parks Citizens Advisory Commitee, Anna Vrska; long-time actist and community volunteer Cindy Brenneman; former council candidate and educator Chris McEvoy and former council candidate, businesswoman and community volunteer Sue Lester. Not a single one spoke in favor of the proposed changes. There was NO voice supporting this unilateral move by Righeimer to quash criticism of his actions by bifurcating the Public Comments and trailing the "pulled" Consent Calendar items. Most of the evening three sycophants of the majority - announced council candidate Lee Ramos, confused and confusing blogger Dennis Popp and major bootlicker of the majority, Howard Hull - sat snuggled together in the back row observing the proceedings and chatting with each other. DON'T CONFUSE THE MAJORITY WITH FACTS! 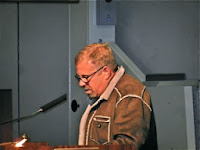 During the council discussion Genis provided some statistics - similar to those presented by Valantine when he spoke - demonstrating that the "Public Comments" were not the problem - that council member comments and lengthy presentations were at least equally to blame for stretching out council meetings. 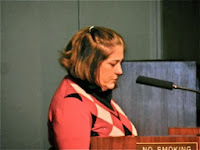 Leece reminded the council of their oath of office - which she read into the record - and that they were elected to SERVE the public, not stifle dissent. 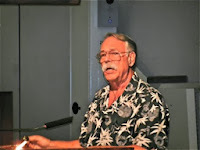 Mayor Pro Tem Steve Mensinger, with a comment almost so obtuse as to be unbelievable, suggested that those folks who felt they were getting shorted in their opportunity to address the council during Public Comments should just give him a call and set up a coffee meeting, where he would be happy to hear them out! The guy is the living embodiment of the term "clueless"! His ego actually lets him believe that a cup of coffee and a chat with him at Starbucks is the same as having the opportunity to air grievances before the entire city council in a public forum! He is one hopeless human being. It's no wonder he doesn't have a job, for goodness sake! 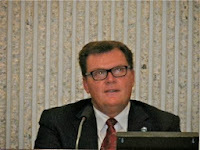 At precisely 12:58 Wednesday morning - following 65 minutes of discussion, including requests and demands by fourteen members of the public to reconsider his self-serving scheme - Righeimer led a 3-2 vote to officially codify the order of business at Costa Mesa City Council meetings and twenty minutes later he closed the meeting after hearing seven residents finally use their chance for a "Public Comment" during the "trailed" segment. 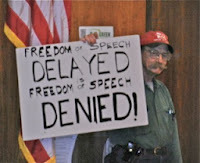 When the meeting was finally adjourned at 1:18 a.m. this morning "Free Speech" in Costa Mesa was placed on life support, joining "Civility" in hospice care in our city. It is now official - when the council meets next in January, 2014 it will be the beginning of an even more oppressive era in our city, where this council majority will use tools they've created to quash dissent and force businesses they don't like out of town. There is only one solution to this problem - the ballot box in November, 2014. Now it's off to the next meeting of the Fairview Park Citizens Advisory Committee at the Neighborhood Community Center(Lions Park) beginning at 6 p.m. today. This one should be even more fun! 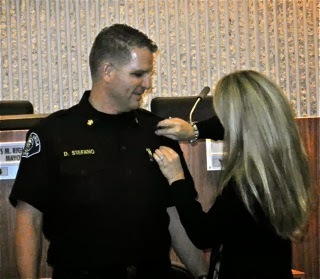 During a well-attended, brief ceremony in City Council Chambers at Costa Mesa City Hall brand-new Fire Chief Dan Stefano was sworn-in by City Clerk Brenda Green. 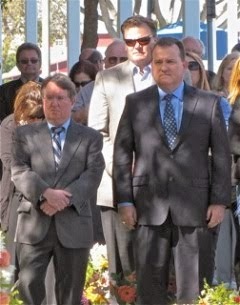 Deputy Chief Fred Seguin was the Master of Ceremonies for this event. He introduced Stefano to the crowd in the chambers, who, in turn, introduced his immediate and extended family - some of whom had traveled hundreds of miles for this ceremony. 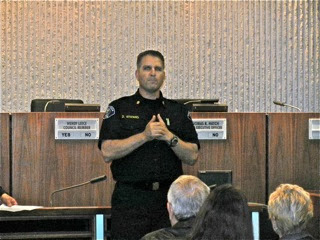 Chief Executive Officer Tom Hatch spoke of the celebration - it's been more than three years since the Costa Mesa Fire Department has had stable leadership. Hatch mentioned the contributions of former interim Chief Kirk Dominic, who was not in attendance today. He also mentioned the very significant contributions of Interim Chief Tom Arnold, who provided mature leadership at a critical time and created a new, more efficient deployment model that will be fully implemented upon arrival of the new ambulances early next year. 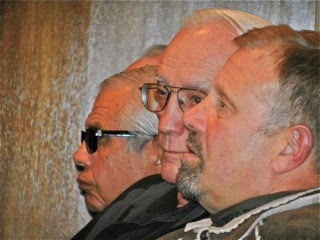 Hatch said he valued Arnold's significant contributions, including the wise counsel he provided to Hatch. He recalls his advice: "Keep calm and move forward." He also gave much-deserved praise to Seguin, who jumped into the role as Interim Chief when Arnold had to step away earlier this year. Hatch acknowledged the contributions to all the members of the Fire Department during the stressful times, pointing out that all the Battalion Chiefs had stepped up and accepted assignments on top of their normal load. 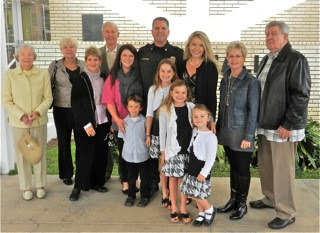 Welcome to Fire Chief Dan Stefano, shown below with his wife, Michelle (a first-grade teacher in the Newport-Mesa Unified School District), their three daughters, Sofia, Siena and Sicily and other members of his family. A community reception will be held in Conference Room 1A at City Hall this evening at 5:00, before the start of the City Council meeting at 6:00. 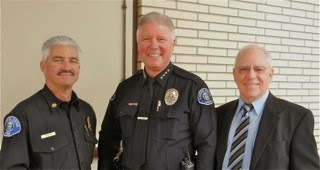 The public is encouraged to attend and meet the new chief. 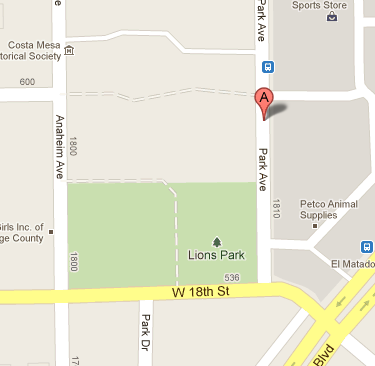 Tomorrow, Wednesday, December 4, 2013, the Costa Mesa Fairview Park Citizens Advisory Committee will hold its final meeting of the year beginning at 6:00 in the Victoria Room at the Costa Mesa Neighborhood Community Center (Lions Park). Taking a look at the agenda, HERE, it appears that this meeting might actually finish within the allotted 90 minutes scheduled. It's unlikely that we will see another meeting like the last one, which was archived via video coverage by Barry Friedland on his Costa Mesa Brief YouTube site. I wrote about it HERE. If you wish to refresh your memory of that meeting - when committee member Anna Vrska created a furor by pointing out some very obvious issues. The archived video is in three segments. #1 is HERE; #2 is HERE and #3 is HERE. I suggest that you watch the first 15 minutes of #1 and the first 15 minutes or so of #3. 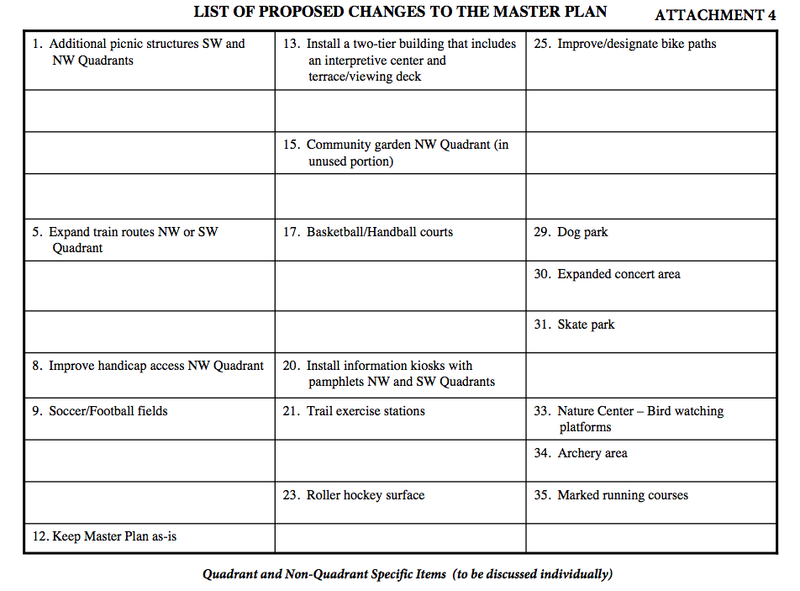 The main item on this agenda is the consideration of the Northwest Quadrant of the park, HERE. There are four attachments to that staff report. #1 is the original list, compiled by the committee on July 17, 2013, of proposed changes to Fairview Park, HERE. 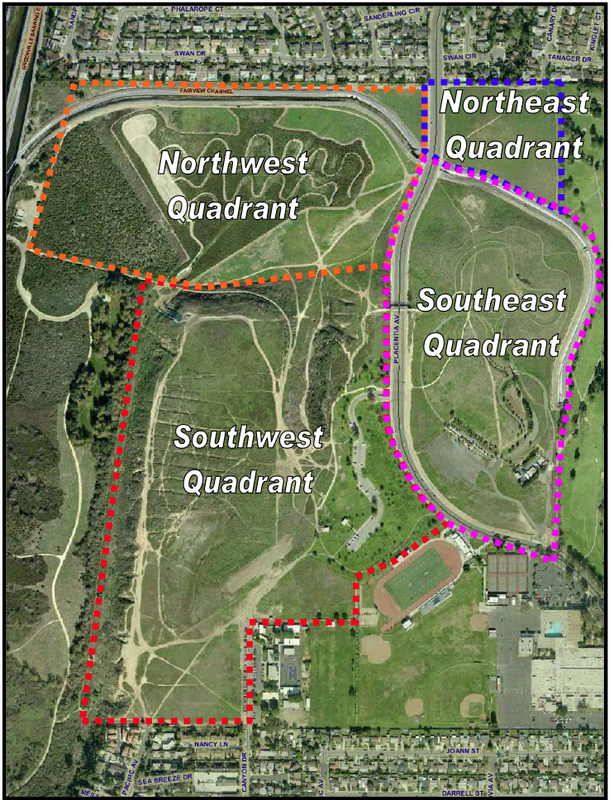 #2 is an aerial view of the Northwest Quadrant of the park, HERE. #3 is a list of items NOT APPLICABLE to the Northwest Quadrant, HERE. The final attachment, #4, is a list of Quadrant-specific items, HERE. 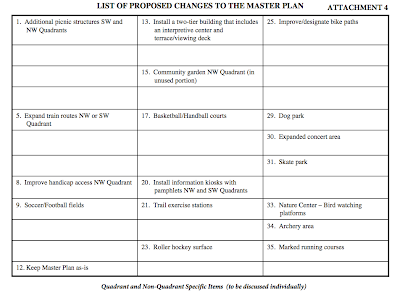 Based on a quick look at the agenda and the aerial map, it seems like almost NONE of the items that are to be considered COULD be placed in that quadrant, hence the anticipated short meeting. We'll see. These meetings have had a very significant public participation. 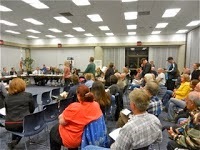 The last one played to a standing room only crowd and had many residents stand and speak to the issues that night. I wonder what kind of a turnout we'll see tomorrow night. There was some serious grumbling by members of the committee about how the last one was conducted, so I wonder if we'll see mutiny in the ranks Wednesday night. Could be fun. See you there.